← How can America’s evangelical Christians who favor Trump justify themselves? Those few analysts who escape their respective silos/academic ghettos rarely get past generalities such as the erosion of social mobility, a dynamic that is clearly economic and social. But the precise mechanisms behind the secular erosion of social mobility are lost in platitudes about how A.I. and robots will free us all to be poets or consumers of a vast and endlessly enjoyable leisure. The key understanding that’s lacking is that economic structures organize and limit the social structures underpinning civil society. To understand why civil society is disintegrating on so many fronts (public health, civil discourse, etc. ), we must understand how our economy has failed to support the social structures required for an integrative, inclusive civil society. Our economy is transforming/adapting as a result of powerful secular trends:the 4th Industrial Revolution (a.k.a. the digital-networked-AI-Big-Data revolution), globalization, the commoditization of ordinary capital and labor, the financial and political dominance of quasi-monopolies and cartels, and perhaps the most unrecognized dynamic, the devaluation of ordinary capital and labor in favor of scarce and often rarefied forms of capital and labor in the fields of technology, entrepreneurship and finance. Collectively, these profound structural changes have created a winner take most economy that favors the politically connected, the privileged (i.e. those who are already wealthy, powerful or holding privileged positions) and those few who have mastered scarce skills in financialization, technology and entrepreneurship. 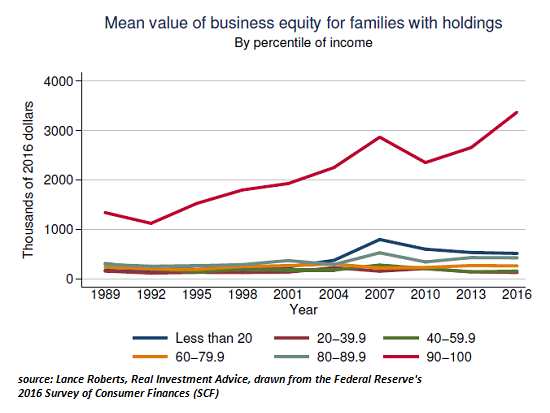 Everyone below this class has seen their income stagnate or decline, and their household wealth erode unless they happened to own homes in skyrocketing markets or happened to have stock options or some other substantial (and relatively rare) ownership of income-producing assets such as a profitable family business. My analysis of IRS income found that at most a few million households out of America’s 130 million households have productive assets (i.e. 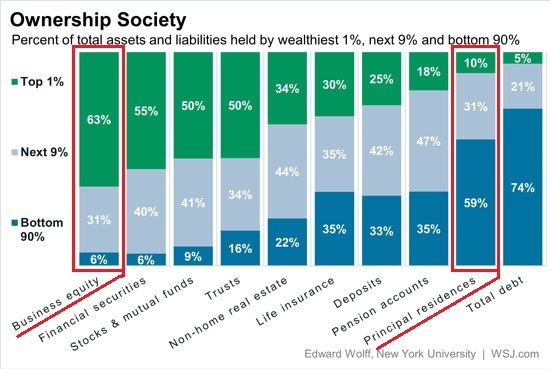 assets that generate net income) that aren’t tied to asset-bubbles in real estate and stocks. Once those bubbles pop (and all asset bubbles eventually pop), then the millions of households who reckoned their bubble-era wealth was a permanent feature of their lives will discover that bubble-era “wealth” is temporary, a phantom sort of wealth that vanishes as quickly as it arose. The top tier of our economy lives in a different society than the bottom 90%.Some of the socio-political manifestations of this reality are discussed in a lengthy Atlantic essay: The 9.9% Is the New American Aristocracy. If we read between the lines, we discern the differences in the economic classes are not just differences in higher education credentials or skills–the fantasy that all we need to solve these structural asymmetries is “more job training”–but differences in values, social networks, family structures and perhaps most invisibly to critics left and right alike, in the positive social roles available to their children. The foundation of any economy is its money, and this is why I keep saying: if you don’t change the way money is created and distributed, you change nothing. Yes, we can tweak various financial parameters and delude ourselves into believing that yet another raft of laws and regulations will actually reverse the erosion of civil society or reverse the rapidly widening gulf between the top 5% and the bottom 95%, but delusions aren’t reality. If we want to extend the opportunities for positive social roles to everyone, we have to change the way money is created and distributed in our economy.That will require a transformation not just in whiz-bang technology but in the foundations of our entire economy. This entry was posted in General and tagged 4th Industrial Revolution, civil society, New American Aristocracy, positive social roles, social asymmetry, social mobility, winner take most economy. Bookmark the permalink.